Soup is not just for winter this summer minestrone soup is a simple celebration of fresh and bright summer produce and is a great summer meal! 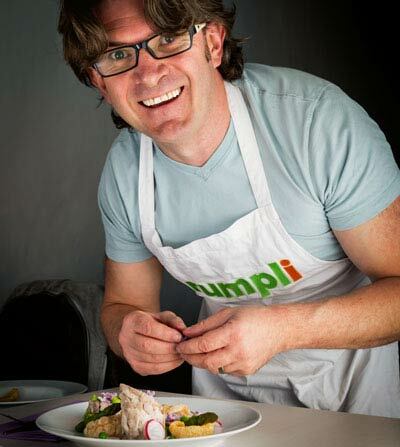 My love affair with soup is well documented here on Krumpli and this summer minestrone soup is an ode to my garden. For some strange reason soups are often associated with winter warmers, and sure they are great at that. But they can also be the most wonderful light and vibrant summer meals. This particular summer soup contains all that is good in my garden at the moment. 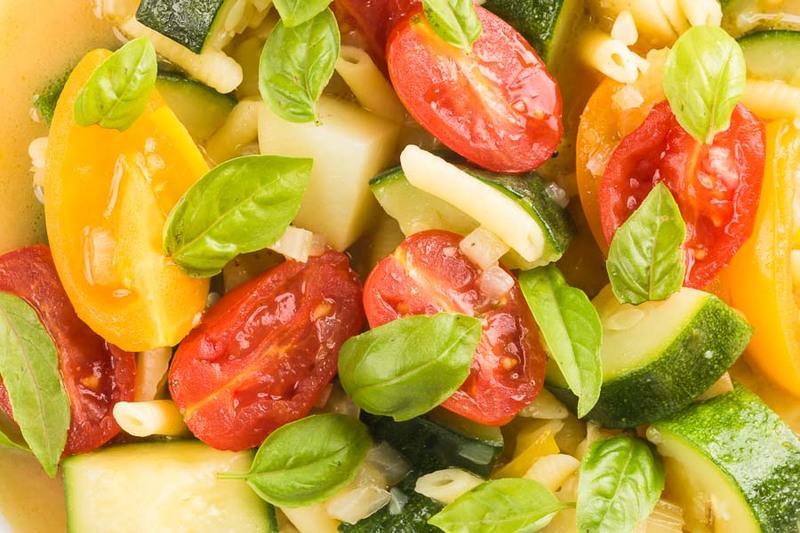 Courgettes, or Zucchini as you Americans know them, tomatoes, new season potatoes, garlic, basil, and oregano. It is the way with minestrone soup as my winter minestrone soup contains all that is good from my garden at the end of autumn! So for me, this recipe is extremely frugal, but in reality, this filling little gem of a soup recipe really costs very little. Feel free to play around with the ingredients that you can get. What we have here really is a chunky vegetable soup with a vegetable broth that is enriched with parmesan cheese. I am sure you get fed up with me saying this! When it comes to broth-based soups like this summer minestrone soup or indeed this hot and sour shrimp soup your stock or broth is the most important ingredient. Don’t be tempted to duck out and use a cheap stock cube, it will taste crap! As I mentioned above I certainly do not believe that soup means winter food! 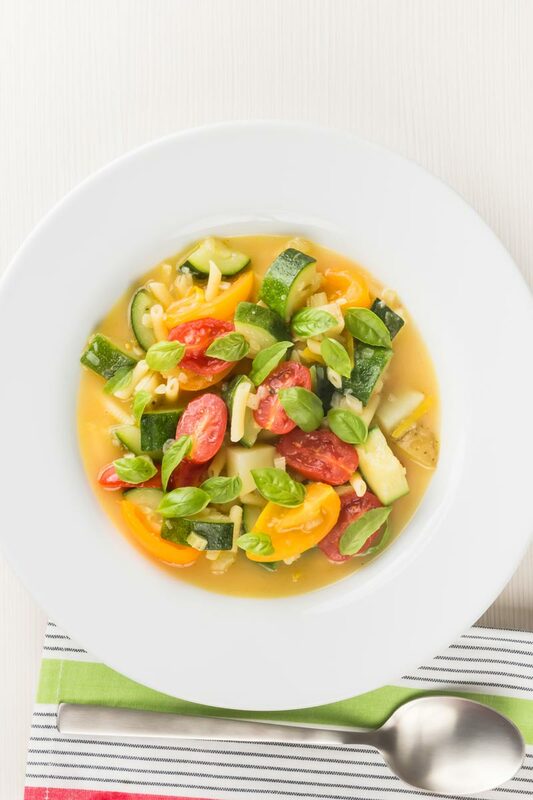 Soups have a magical way of fitting into all seasons, this summer minestrone soup is bright, vibrant and zingy. I have a whole host of recipes that do something similar! It is not all about gazpacho either. I have the most insane tomato packed tomato consomme that I serve with tortellini. That recipe is a real gem and one you simply must try! At the start of summer, this beautiful subtle cream of asparagus soup slams shut the idea that ‘cream of’ soups are for winter. Then you can have a play with North African flavours with this chicken and chickpea soup. It certainly is all summer zing and not a winter water as you would expect from chickpeas. I do however have a line, the Hungarians are very fond of something called meggyleves. It is a chilled sourcream based sour cherry soup and it really does not sit well in either my mind or my mouth! 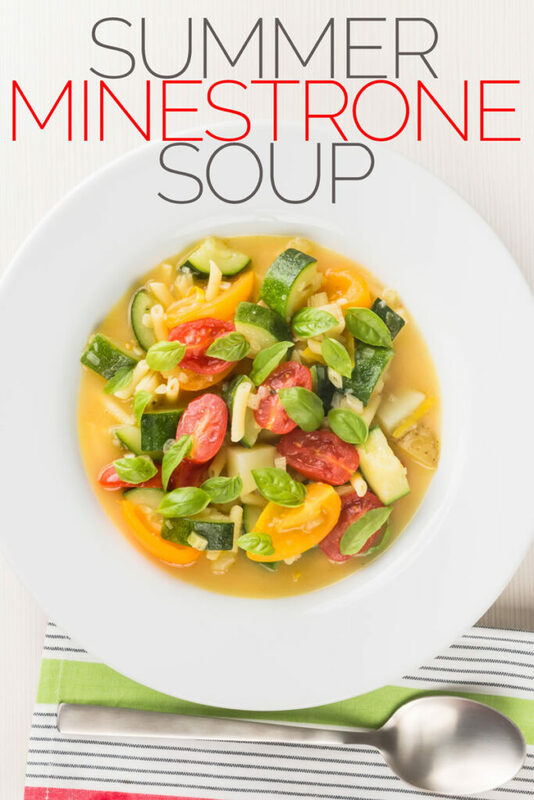 What is a Minestrone Soup? The answer to what is a minestrone soup like many ancient foods is largely open to interpretation. 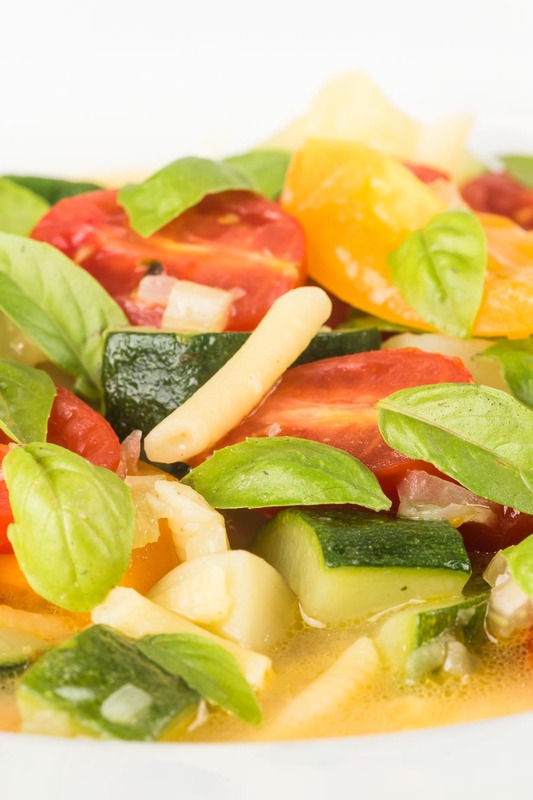 The origins of the largely vegetable-based minestrone soup dates back to pre-roman times. As you may well imagine in the 2,000 plus years since it has undergone huge changes. Naturally many have tried to own it and tell others that their version is ‘wrong’. As with many ancient soups, they were a way to use up leftovers, with a stock pot being added to as time goes on. Meals developing and evolving all of the time. In modern times it has become known as a vegetable soup with rice, pasta or beans and indeed any combination of the three. In reality, a minestrone soup is a name for a group of recipes. There is no authentic recipe, so for once my food does not run the risk of alienating food nazis! Finely dice your celery and onion. Slice your chili into discarding the seeds. Heat the olive oil in a pan over a medium heat and add the chili, onion, and celery and cook for 5 minutes. Stir occasionally but do not allow the vegetables to colour. Cut your potatoes into a 1cm 'dice'. Mash your garlic and scrunch up the oregano to get the oils flowing. Cut the courgette into quarters lengthways and then into lengths about 1cm long. Add the potatoes, courgettes, garlic, and oregano to the pan season with salt and pepper and cook for 10 minutes stirring occasionally. NOTE: how much salt you need will be defined by your vegetable stock. Cut your cherry tomatoes into halves or quarters depending on size. Pour in the vegetable stock and cook for 5 minutes. Add the parmesan cheese and pasta and again cook for 5 minutes. Add the tomatoes and cook until just warmed. Finally serve with lots of fresh basil leaves. This soup looks amazing, I’d love a bowlful! 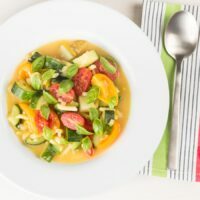 Love that you’ve got a summer version of this soup, it has such delicious summery ingredients and looks so colourful too! This sounds light, fresh and perfect for summer. I don’t mind eating soup when it’s hot at all. I love soup any time of the year, it’s so comforting. This sounds delicious. This looks so light and refreshing! I love how colorful it is. Lovely combination of vegetables! So bright and healthy. There’s nothing better that a soup filled with fresh seasonal veg…this looks so delicious! I couldn’t agree with you more Brian that soup is only for winter. I practically eat it all year round, and just about every day too. 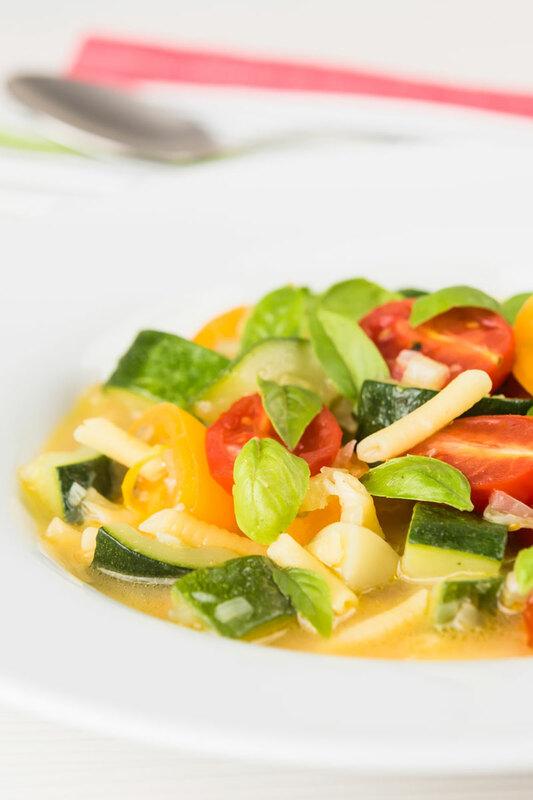 This summer minestrone soup is a delicious meadley of fresh summer flavours. I’m ready to dive in with my spoon at the ready! Yum!